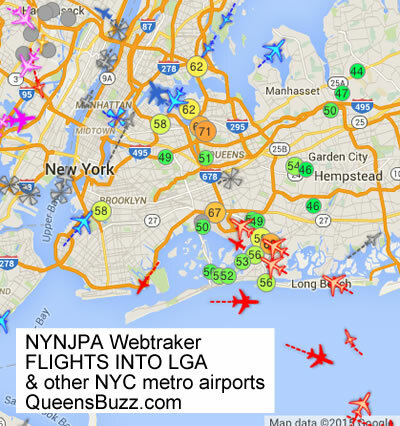 October 19, 2015 / Jackson Heights Neighborhood / Queens Issues LaGuardia Airport Noise LGA / Queens Neighborhoods / News Analysis & Opinion / Queens Buzz. Click here to read the rest of this report about LaGuardia Airport Airplane Noise and the NYNJPA & FAA in Queens. The report includes video presentations, including some audience interaction, and a photo slide show and other information about FAA air traffic changes, airplane noise and what you can do about it. 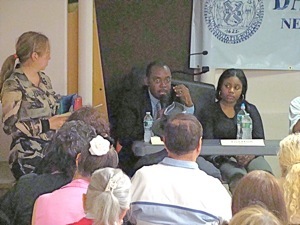 September 30, 2013 / Jackson Heights Neighborhood / Queens Issues / Queens Buzz News. 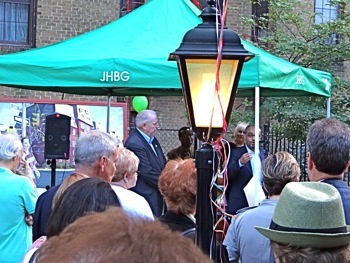 I had the pleasure of spending some time at the celebration of the 25th anniversary of the Jackson Heights Beautification Group’s existence. During the course of the evening I had the opportunity to talk to a number of members, many of whom had been with the organization for decades. And during the course of these conversations I came away having learned something about their collective accomplishments, and in some senses, the early to modern history of Jackson Heights. The Jackson Heights Beautification Group [also known as JHBG] started when a group of residents decided to 'take back the neighborhood' from vandals doing property damage [grafitti], real estate developers knocking down high quality historic buildings, people breaking sanitation laws [doggie doo], and developers trying to obtain zoning variances that would downgrade the neighborhood. But the community organization was not just about participating in the governance process and ensuring that the city laws and ordinances were enforced; they also sought to enhance the quality of neighborhood life. 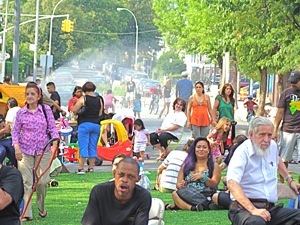 Hence the Jackson Heights Beautification Group sought funding for summer concerts, helped bring a farmers market to Jackson Heights, worked collaboratively to create more public parkland [78th Playstreet & the Garden School Athletic Field], and most recently helped start an orchestra. They will be the first to tell you that they didn't do these things by themselves, but however modest, they did play an important role. 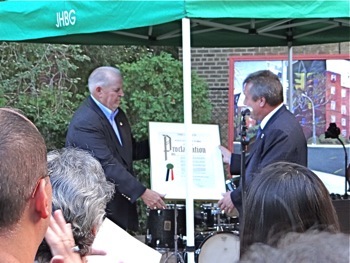 In the photo above City Councilmember Daniel Dromm gives an award to Jackson Heights Beautification Group President Edwin O'Keefe Westley honoring the neighborhood group's service to the community. And so you may click here to learn a bit about the formation and history of the Jackson Heights Beautification Group, as well as a bit about the 20th century life in Jackson Heights as told by those who lived it. 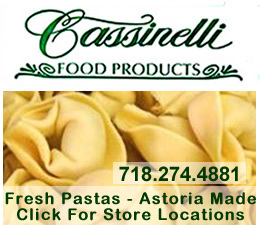 May 22, 2012 / Flushing & Jackson Heights / Queens Business / Queens Buzz. 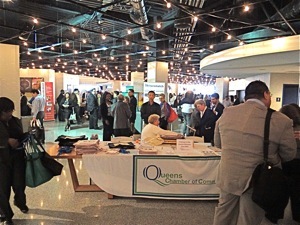 I attended the Queens Chamber Biz Expo at CitiField on Tuesday. 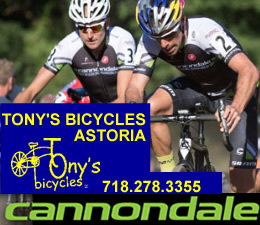 The event runs from 10 am - 3 pm, offering an opportunity for visitors to browse through the tables of between 50 - 75 or so businesses offering services in Queens. While some of the businesses at Biz Expo 2012 at CitiField were the larger firms with national brands, the majority of the companies in attendance were home grown Queens businesses, covering a range of products and services offered in the borough, including a number of relatively new companies in the food and energy fields. In the photo above is the entrance to the Queens Chamber of Commerce Biz Expo 2012 at Caesar's Club at CitiField in Flushing. 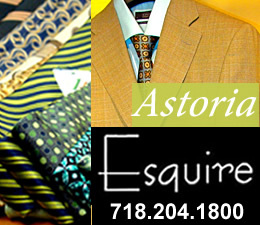 Click here to read the rest of our report including Queens Chamber of Commerce Biz Expo 2012 photos. April 15, 2012 / Art in Queens / Jackson Heights / Queens Buzz. 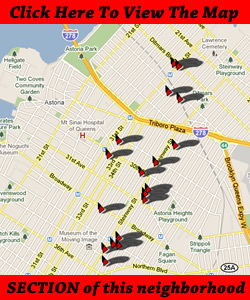 I rode my bike through the backstreets of Woodside on a warm spring Sunday of 2012. The sun was glistening, the air was fresh and warm. People were working in their yards, conversing in the streets, and heading to or from somewhere. And I was on my way to the Stillspotting kiosk in Jackson Heights. A few weeks ago the Guggenheim Museum had contacted me about the Stillspotting program they were to launch in Queens starting April 14th. After a few brief conversations with the publicists, I thought I had a sense of it, but my understanding - like the concept itself - was fluid. I wasn’t sure whether or not it would be interesting, but I decided to check it out anyway. 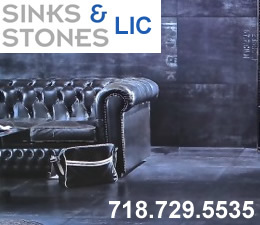 Click here to read more about Stillspotting Queens in Jackson Heights. 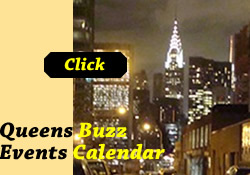 January 18, 2012 / Jackson Heights / Performing Arts in Jackson Heights / Queens Buzz. 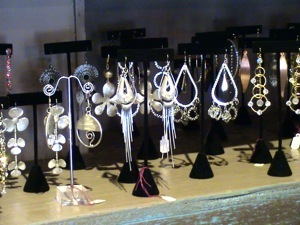 I just returned from previewing Jackson Heights 3 AM. It’s the third of a trilogy put together under the direction of Ari Kreith of Theatre 167 about the Jackson Heights neighborhood. The play is as mixed as the neighborhood, combining comedy, tragedy and romance to portray the late-night life in the multi-ethnic neighborhood of Jackson Heights. The cast of actors and actresses did a great job of caricaturing a wide swath of late night personas, as they drew us into the post midnight hours along Roosevelt Avenue; journeying into some of the drama and humor that might generally accompany a late night voyage into NYC urbanity in northwestern Queens. Click here to read our review of Jackson Heights 3 AM by Theatre 167. October 25, 2011 / Jackson Heights Neighborhood / Real Estate in Jackson Heights / Queens Buzz. I just returned from a fascinating look into the Census data for Jackson Heights, Corona, Elmhurst, Flushing and Woodside. Fascinating? Yes, fascinating. Fascinating because there have been significant demographic shifts in these neighborhoods over the past decade. 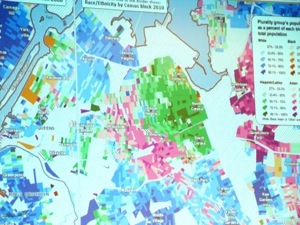 And because Steven A. Romalewski, Director of CUNY Mapping Services, gave us a demographic map presentation, the likes of which I’d never seen before. Arturo-Ignacio Sanchez of Community Board Three added quite a bit of qualitative flavor to the presentation, reminding me of some of my best college professors [because he was knowledgeable and enthusiastic]. Danny Dromm, the NYC City Councilmember of Jackson Heights was the sponsor of this presentation. But I digress. Click here to view our report on the 2010 Queens census [with exclusive emphasis on Jackson Heights / Corona / Elmhurst & adjacent neighborhoods], including slide show with many of Steven Romalewski’s slides and a link to an interactive mapping site. September 23, 2011 / Elmhurst Neighborhood / Queens Buzz. I attended a seminar on Renters' Rights sponsored by City Councilman Daniel Dromm. The panel was intended to provide tenants and landlords with an awareness of their rights and guidance to the proper city agency in order to obtain resolution of one's grievance(s). One statement I'll make upfront, is that comprehending the statutes and determining who has jurisdiction with respect to a grievance, isn't simple. Hence in the report that follows, we will try to provide some insight into the process, but recommend that you contact the city using the 311 telephone number to initiate any claim or to seek reference in defending against a claim. Click here to read our report about rights of landlords and renters in Queens. This report to be posted Columbus Day Weekend. August 20, 2011 / Jackson Heights Neighborhood / Queens Buzz. I attended the iVote Festival in Jackson Heights on Saturday to see what it was all about. The event was sponsored in part by the Humanist Party, which wants to restore “an old practice” of allowing legal residents the right to vote in municipal elections where they work, live and pay taxes. According to sources at this event, there are currently 1.3 million legal residents in New York City who don't have any voting rights in NYC. We were told that by some estimates, 60% of Jackson Heights residents are legal residents who have no representation in local government. Apparently obtaining U.S. Citizenship is far more difficult that just passing a test. Click here to read more about legal residency, citizenship and voting rights in Queens which were discussed at the iVote Festival in Jackson Heights neighborhood. March 14, 2011 / Jackson Heights / Dance & Theater / Queens Buzz. I was able to preview the new play, You Are Now The Owner Of This Suitcase, now in progress at 167 theatre in Jackson Heights. It's an original work written by about seven people. 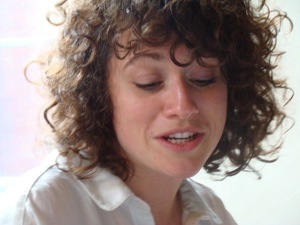 The producer came up with the approach to collecting material for the play, and then in collaboration with a dramaturg, worked with the group to shape it. 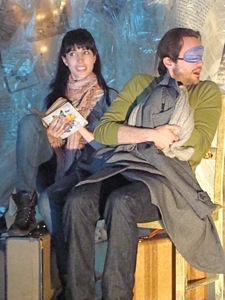 Click here to read our report about You Are Now The Owner Of This Suitcase by theatre 167, including a photo slide show of the play which runs last three weekends in March 2011 at PS 69 in Jackson Heights. Will There Be Mardi Gras Parade For Jackson Heights? March 7, 2011 / Jackson Heights / Queens Buzz. 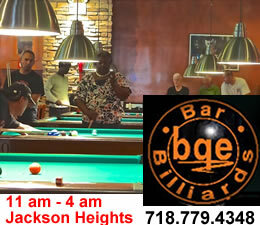 On Saturday night, the weekend before the Catholic celebration of Ash Wednesday, Jackson Heights celebrated Mardi Gras. We attended our first real Mardi Gras celebration in Queens, which included sampling the bayou gumbo, real muffalattos, kings cake and Louisianna style hurricanes [a powerful drink that packs a punch]. Following a gathering of the krewe, we took to the streets wearing masks and carrying beads, off to wish our neighbors well. 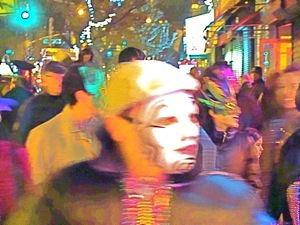 The photo to your left is of the krewe heading down 37th Avenue in Jackson Heights on Saturday night. Click here to view the rest of our report about the Mardi Gras in Jackson Heights, including photos and slide show. 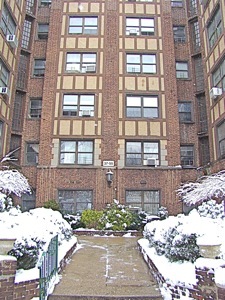 March 23, 2011 / Jackson Heights Real Estate & Elmhurst Real Estate / Queens Real Estate / Queens Buzz. 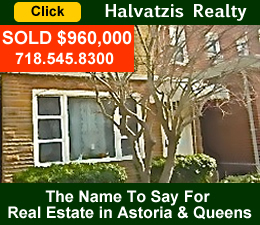 This is the Jackson Heights Real Estate & Elmhurst Real Estate section of the site. 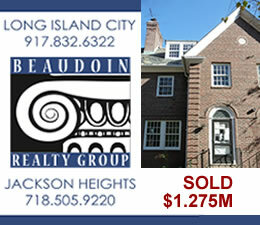 Click here to view reports about Jackson Heights realtors & real estate in Queens. 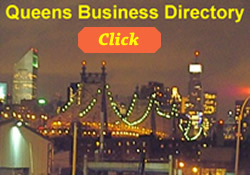 Click on the icon below to view business directory for Jackson Heights & Queens.